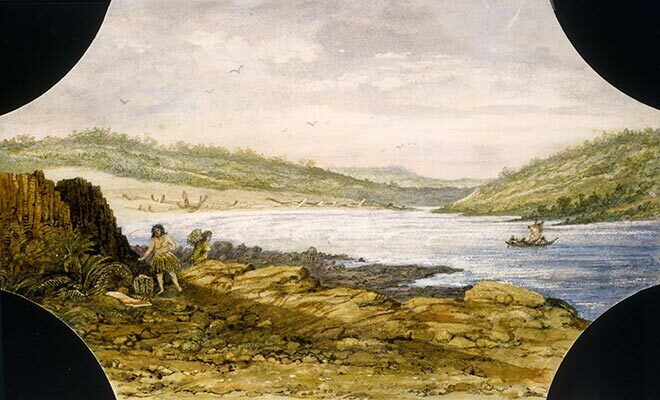 Many Māori communities were based on the coast, as can be seen in this watercolour of Porirua Harbour (north of Wellington) by Samuel Brees. It was probably painted looking from Plimmerton. Some Māori are collecting shellfish from the rocks, others perhaps are fishing from the canoe on the water, while on the distant beach near the entrance to the harbour, a number of canoes are drawn up. In the light of such widespread use, Māori assumed they had customary rights to coastal areas.